As development of the Bridge City mixed use precinct north of Durban gathers pace, essential services are being rolled out in tandem with the laying down of physical infrastructure. A key component to realising the vision of a viable and vibrant retail, business, residential and light industrial estate that caters equally to the needs of tenants, consumers and commuters is that of safety and security. This is the responsibility of the Bridge City Management Association (BCMA). “It is essential that security is approached in a co-ordinated, proactive manner to minimise risk and ensure that criminals are deterred from targeting owners, tenants and visitors to Bridge City,” says Precinct Manager, Iain Laing. This priority will take on even greater importance as the number of commuters and visitors grow with the development of the precinct. As an integral link in the GO! Durban integrated rapid public transport network that includes a rail station and major junction in the bus rapid transport (BRT) system, Bridge City will accommodate an estimated 100,000 commuters daily once it is fully functioning. The Bridge City Shopping Centre, which opened in 2009, is already fully operational and attracts a high number of shoppers monthly. “These numbers present a major challenge unless you are prepared and have systems and procedures in place to prevent opportunistic crime. Contrary to popular belief, this extends well beyond technology such as the CCTV camera systems that will be deployed throughout the precinct this year,” Laing says. This responsibility falls squarely onto Laing’s shoulders as precinct manager, which includes overseeing Bridge City’s common areas. With a long history as a regional police commander, loss control manager for numerous production plants and extensive experience running residential estates, Laing is well qualified for this task. The overall security control is performed by a team of security personnel who conduct foot and vehicle patrols 24/7 throughout the 60ha Bridge City development. Laing says the key to managing security on such a scale is to apply a system of visible policing, backed by a proven crime management strategy. This is an approach that he has developed over the years and which allows his team to track incidents and respond appropriately to crime hotspots. “In this way, we’re able to stay one step ahead of criminals by plugging any gaps and acting proactively rather than reactively,” he says. Proof of this approach can be measured in the zero crime incident rate recorded over the most recent holiday shopping season, as well as fewer than 10 crime incidents in the past three months – a record which few suburbs can boast. 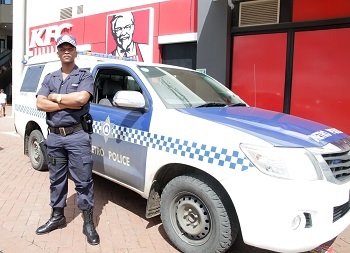 While his area of responsibility lies in the precinct’s common areas, he also co-ordinates security measures with the Bridge City Shopping Centre security team as well as with its tenants to prevent petty crimes such as shoplifting. His focus on security measures will increase as more commercial and residential properties are developed, with the aim to produce a co-ordinated security monitoring and response system across all areas. This would include co-ordination with the SA Police Services, as well as security teams that are currently responsible for the Bus Rapid Transit Transport routes and rail station. The developer, Effingham Development Joint Venture, has commended the BCMA for its significant successes in securing the safety and security of Bridge City.